As I was sitting at the dining table having breakfast with my laptop, I was reminded that in between the hooligans, graffiti and vacant foreclosed homes, there is something worthy of praise from my childhood hometown of Stockton, CA. No, not ghost riding the whip! Walnuts. Yes, walnuts. What made me think of this? Well, I had gone grocery shopping at Albertsons the other day (a store, incidentally, that is now called Lucky in Stockton after another controversy). In other stores, such as the Sunflower Market (my favorite), has bulk bins, but not Albertsons. 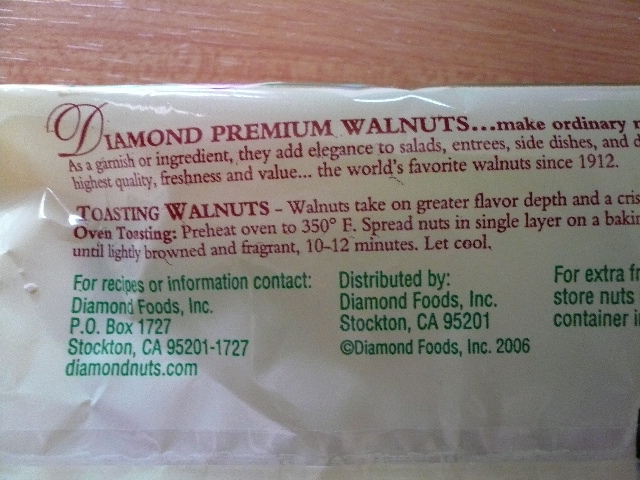 Hence, I purchased a package of shelled walnuts, and when I opened it this morning to sprinkle some on the salad I had just made (yes, for breakfast! ), the packaging logo jumped out at me. “Diamond of California,” I mumbled to myself. “Where do I know that name?” I seemed to recall reading a story about them about 15 years ago, but couldn’t quite place it. Something about illegal immigrants, I thought. Ah, yes. It makes perfect sense. This bag of omega-3 goodness was from the hometown of my youth, the nuts no doubt harvested from the acres of evenly spaced walnut trees, at least the ones that hadn’t been burned down and cleared to make way for yet another dollar supercenter. Just kidding. Stockton actually recently banned big-box stores larger than 100,000 square feet after it was reported that Wal-mart wanted to build as many as six there! Thankfully, I can attest their nuts taste much better and are presumably a lot healthier for you than office supplies. So here’s to you Diamond of Stockton, and may you sell plenty of walnuts at Sam’s Club.